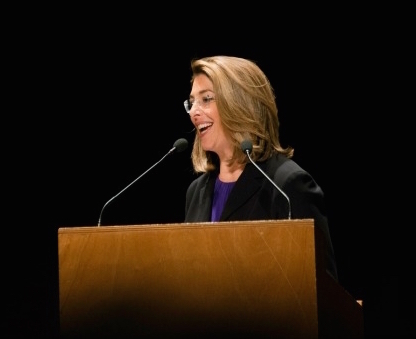 Naomi Klein—activist, author, and self-described “secular Jewish feminist”—spoke at the Vatican on Wednesday where she championed the Pope’s message for global action on climate change and made the case for “the beautiful world” beyond fossil fuel addiction. Klein, who was invited to speak by the Vatican, gave her speech ahead of a two-day conference to discuss the Pope’s recent encyclical, Laudato Si’, on the environment and the threat of the global economic system—subjects that the author of This Changes Everything: Capitalism vs. the Climate knows well. “Pope Francis writes early on that Laudato Si’ is not only a teaching for the Catholic world but for ‘every person living on this planet.’ And I can say that as a secular Jewish feminist who was rather surprised to be invited to the Vatican, it certainly spoke to me,” Klein told reporters ahead of the conference, which is called People and Planet First: the Imperative to Change Course.